Agnes Bertha Marshall. Source: Mrs A.B. Marshall’s Larger Cookery Book of Extra Recipes. 1904. Agnes Bertha Marshall was a celebrity cook during the second half of the 1800s, and wrote four cookbooks with many illustrations. She was particularly known for her work with chilled desserts, and is credited with inventing the first portable, edible ice cream cones (which she called “cornets”). Marshall even patented a machine to make ice cream and subsequently freeze it in five minutes flat, and wondered about using liquid gas to make ice cream. She was born on 24 August 1855 in Walthamstow, Essex, (now part of greater north-east London) to John and Susan Smith. John was a clerk. While Agnes was young, John died, and her mother remarried. Agnes learned cooking at home, and learnt more working under “skilled Parisian and Viennese chefs”, according to the Pall Mall Gazette. By 1881, the couple were living at 6 Wellington Road in Marylebone, London, in the area north of Soho now called “Fitzrovia”. In 1883, the couple purchased the building which housed the National Training School of Cookery at 30 & 32 Mortimer Street. Working together, the couple renamed the school to the “Marshall School of Cookery”, and by 1885 had boosted the number of students from the forty that they had inherited with the school, to close to two thousand. Classes were given seven hours a day, every day except Sunday, and could be taken on a daily, monthly, semester or year-long basis. She had instructors come in to teach specialty topics. Curry lessons were given by a colonel who had been in India; haute cuisine was taught by a Cordon Bleu graduate. Over the next ten years, the couple also opened in the building an employment agency for domestic staff and registrar for cooks, a food shop which sold the food prepared by the students, and a shop selling household equipment and cooking supplies including flavourings, spices, syrups, etc that they sold under their own “Marshall’s” label. She went on tours to lecture and give demonstrations, and advocated improved food hygiene. Her first lecture tour had her giving six talks a week in Birmingham, Glasgow, Leeds, Manchester, and Newcastle. It was such a success that on her second lecture tour, she added a further twelve cities to the roster. The 1891 census (RG12/90 Folio 39) listed the couple as having seven servants: two cooks, one parlour maid, two housemaids, one kitchen maid and one scullery maid. In 1894, after publishing what would be her last book, “Fancy Ices”, she and her husband decided to spend more time at their country place on the River Pinn in the town of Pinner (now part of the London Borough of Harrow.) The 1901 census (RG13/1210 Folio 15) showed them living at The Towers West End, Pinner, Hendon, Middlesex. Their daughter, Agnes A., was 21 at the time and living with them, along with six servants. In 1904, she had a fall from a horse there while out riding, and died of complications from it the following year, 1905, in Pinner, at the age of 49. She was cremated at Golders Green crematorium. 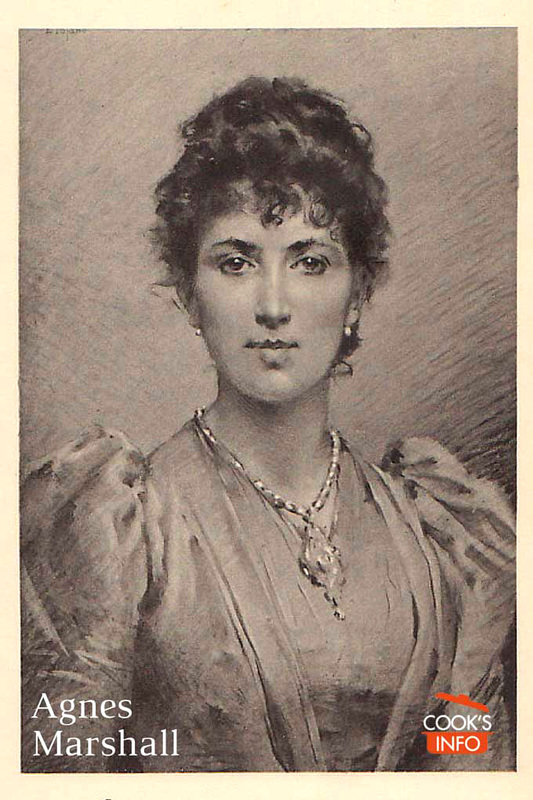 Her husband Alfred sold the rights to her books to Ward Lock, the publisher of Mrs Beeton. Alfred also tried to keep some of the various businesses running, but didn’t succeed. The archival collection of her papers was lost in a fire in the 1950s. Exhibitions about her were held in 1998 at Syon House (London home of the Duke of Northumberland), and again in 1999 at the London Canal Museum. A biography of her was published in 1998: Mrs Marshall: the Greatest Victorian Ice Cream Maker. The Church of St John the Baptist in Pinner has a stained glass window in memory of her. 1885. The Book of Ices. “Liquid air will do wonderful things, but as a table adjunct its powers are astonishing, and persons scientifically inclined may perhaps like to amuse and instruct their friends as well as feed them when they invite them to the house. By the aid of liquid oxygen, for example, each guest at a dinner party may make his or her ice cream at the table by simply stirring with a spoon the ingredients of ice cream to which a few drops of liquid air has been added by the servant; one drop in a glass will more successfully freeze champagne than two or three lumps of ice and in very hot weather butter may be kept in better condition on the table and make milk free from any suspicion of sourness by adding a drop of liquid air to an outer receptacle into which a jug or butter dish is placed. Liquid air will, in short, do all that ice does in a hundredth part of the time. At picnics it would be invaluable and surely ought to be kept freely on hand in hospitals.” — Agnes Marshall, 1901. “Mrs Marshall in Fancy Ices suggests a number of ways of serving ice-cream cones. Margaret Cornets were made with half a pound of finely chopped or ground almonds, four ounces of caster sugar, four ounces of fine flour, two eggs, a saltspoon of vanilla essence and one tablespoonful of orange-flower water. They were then filled with half ginger ice-water and half with apple ice-cream…. Christina Cornets were the same recipe as Margaret Cornets but filled with ice cream to which was added dried fruits — greengage, apricot, dried ginger, cherries, etc., cut into very tiny dice shapes and ‘as much ground cinnamon as would cover a three-penny piece, the same quantity of ground ginger, and a tablespoonful of Marshall’s Maraschino Syrup'” — Weir, Robin. More on the Origin and History of the Ice-Cream cone. In: Milk: Beyond the Dairy : Proceedings of the Oxford Symposium on Food and Cookery 1999. Harlan Walker, editor. Oxford Symposium. 2000-08-01. Page 349. “Agnes B Marshall (the “B” is for Bertha) was born in 1855, and had a successful career as a cookery teacher… But it was ice cream that was her passion. She is credited with being one of the first cookery writers to mention “cornets… made with almonds and baked in the oven”, and patented a design for a wooden machine which she claimed could freeze a pint of ice cream in five minutes (it has since been tested by the food historian, Ivan Day, and it turns out she was being entirely truthful). She used this machine to make the most spectacular moulded ices, among them her extraordinary Rosseline Bombe, a snowy confection flavoured with rosewater, maraschino and preserved cherries. I saw an engraving of this bombe – it was wearing spun sugar, in the manner of a mourning veil – and I fell in love. What a strange, beautiful thing: that in a world without refrigerators she was turning out stonking great banquets – towers of fruit, fat bunches of “asparagus”, serene-looking swans – made entirely from ice cream and sorbet.” — Cooke, Rachel. My Ice-Cream Obsession. Manchester: The Observer. 18 July 2010. Pentelow, Mike and Marsha Rowe. Characters of Fitzrovia. London: Chatto and Windus. 2001.